Complete the form and we endeavour to get back within 1 hour! Please fill in your details below. I consent to The Floor Doctor saving my data and using it to reply to my enquiry. 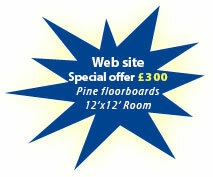 Our web site special offer is for a typical room with pine floorboards and £300 is an all-inclusive price. All our quotes are competitive so if you have a different size room or herringbone floors then call us to get a free estimate. We are happy to quote for any job however big or small. We need to know the floor area, type of wood, the condition and the finish you are looking to achieve. You could email us for a quick quote or we can visit you to give you an on-site estimate and discuss the different finish options. We operate across Central England - based in Rugby we are convenient for all of Birmingham, Warwickshire, Northamptonshire, Gloucestershire, Bedfordshire and Leicestershire. 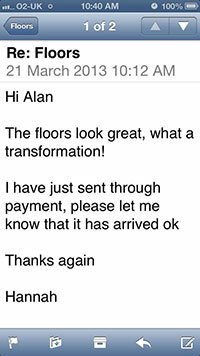 The Floor Doctor has renovated floors throughout Central England - we use the best quality tools and materials to give you a long and lasting finish.